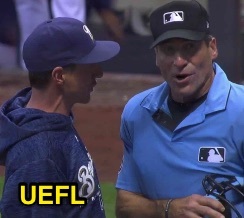 HP Umpire Angel Hernandez ejected Brewers Manager Craig Counsell (ball four/walk call; QOCN) in the top of the 9th inning of the Diamondbacks-Brewers game. With none out and none on, D'Backs batter Jake Lamb took a 2-2 fastball from Brewers pitcher Corey Knebel for a called third ball and 3-2 fastball for a called fourth ball. Replays indicate the 2-2 pitch was located off the outer edge of home plate and belt-high (px -.795, pz 2.470) and the 3-2 pitch was located over the inner half of home plate and thigh-high (px .502, pz 2.029 [sz_bot 1.601 / RAD 1.726 / MOE 1.809], the call was incorrect. * At the time of the ejection, the Brewers were leading, 1-0. The Brewers ultimately won the contest, 1-0. This is Angel Hernandez (5)'s first ejection of 2018. Angel Hernandez now has -7 points in the UEFL Standings (-5 Prev + 2 MLB - 4 Incorrect Call = -7). Crew Chief Larry Vanover now has 10 points in Crew Division (10 Previous + 0 Incorrect Call = 10). *The 3-2 pitch was located 2.952 horizontal inches from being deemed a correct call. *The 3-2 pitch was located 2.640 vertical inches from being deemed a correct call. This is the 46th ejection of the 2018 MLB regular season. This is the 18th Manager ejection of 2018. This is Milwaukee's 3rd ejection of 2018, T-1st in the NL Central (CHC, MIL 3; PIT 1; CIN, STL 0). This is Craig Counsell's 2nd ejection of 2018, 1st since April 15 (Hunter Wendelstedt; QOC = N [Balls/Strikes]). This is Angel Hernandez's first ejection since August 14, 2017 (Ian Kinsler; QOC = Y [Balls/Strikes]).